The best blueberry pie you've ever eaten. Even better topped with vanilla ice cream! Meanwhile, stir together blueberries 3/4 cup sugar and cornstarch until well combined. Roll one dough disc out thinly on a floured surface, using a rolling pin, and fit into a 9-inch pie plate, place on a cookie sheet; fill pie shell with blueberry mixture. Roll out additional dough disc and top blueberry mixture; trim and flute edges. Slice some cuts in the center of pie. Whisk together egg and cream in a small bowl and brush evenly over pie dough. 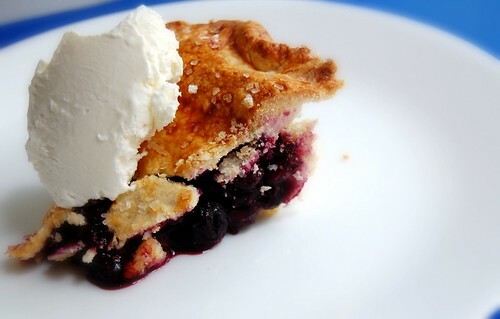 43 comments on "Blueberry Pie"
oooh this looks mouth watering! i made vegan blueberry cobbler with soy ice cream two days ago! how weird?? THIS looks delicious! :) You should try some vegan recipes, I find them a fun challenge! Hope all is well, my condolences for your loss of your Grandmother. have a good day. Mmmmm Blueberry Pie! 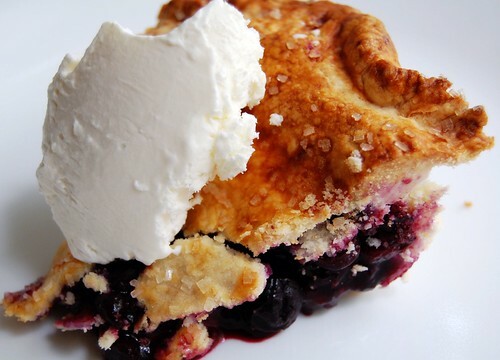 I actually went to get blueberries at my grocery store this weekend and they were all out :o( hopefully I can snag some this weekend...this pie looks so yummy! The pictures are lovely too, the blue just POPs! Mmmm, this looks yummy. But can you believe I've never had blueberry pie? It still looks good though. Yum. Blueberry is probably my favorite kind of fruit pie (although cherry gives it a run for its money). I know that you want to be more inclusive in your recipes, and that's great, but the web is full of blogs for people on special diets. 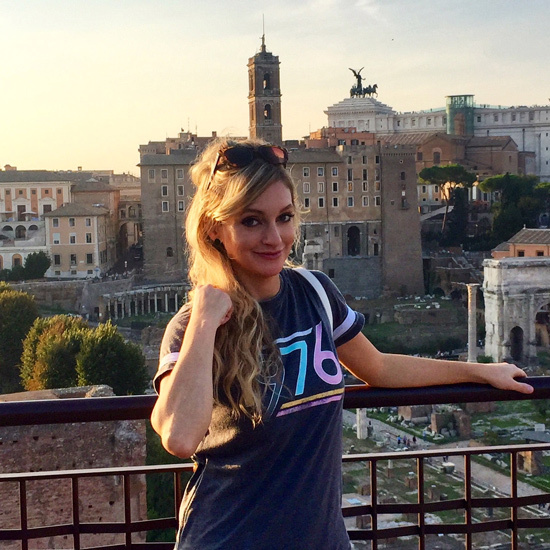 What makes your blog so great is that it's uniquely YOU. The fact that you make what YOU want to make is what makes it so wonderful and special. Never feel that you have to create recipes to please anyone but yourself. Plenty of people love your recipes as they are. It's funny you mentioned tofu. I find that I hate tofu in almost anything unless it's served in an Asian restaurant. Chinese and Japanese restaurant seem to be the only places that prepare it well. wow this looks so delicious! I was actually just thinking about making a blueberry pie the other day- I think you've pushed me over the edge now I'll have to do it! i was scanning the post thinking you were going to say the pie crust was gluten-free and I was going to say "no way!" because it looks way too warm and yummy. gorgeous, glorious, outstanding pie, emily. Yummy golden crust. I support the idea of having allergy friendly recipes :)! ooh, this is like a slap in the face to my failed sour cherry pie from this weekend :/ but i love it anyways! maybe i should take some cues from you and not prebake my crust! This looks completely yum! I'm dairy free and it is HARD to do dairy free desserts sometimes....but I say go for it, I'll be watching anxiously in the wings! I kind of feel like my blog is just for me, so it's ok if I only post recipes for myself :) It is fun to challenge yourself though - I've actually never baked anything vegan, so it would be interesting to try it out sometime. delicious as usual my dear! I don't love blueberries, but this really looks amazing. Especially the crust. 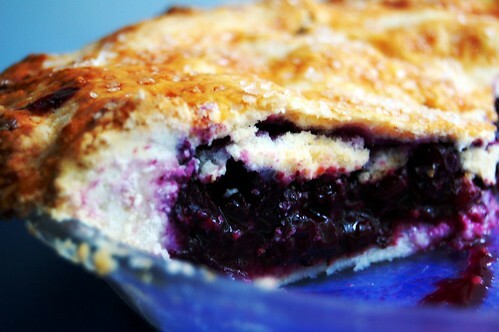 LOVE blueberry pie! 3/4 cup sugar is the perfect amount. My grandfather's recipe had 1 cup and, though delicious, was always a bit too runny for me, so I tried decreasing the sugar to 3/4 cup...perfection! YUM! Why? Why do I look at your blog at night and when I know I'll end up hungry!!!?? 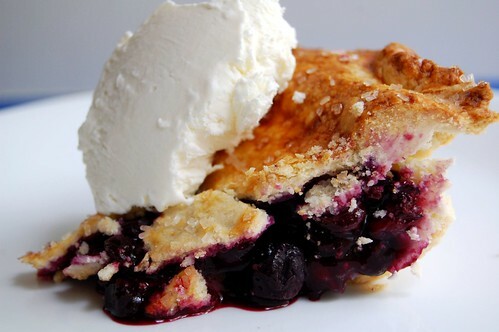 Love blueberry pie. I may have to try to make my own! Except for in my freezer, there is not a blueberry to be found anywhere now, but oh boy, I am so keeping this for summer!!! I'll have to say that some waitress I know are in fact super strong. I mean those plates get heavy. And they way they use their bodies to lift them are impressive. One of my favorites. I'll have to try your recipe since it looks sooo good! I had frozen blueberies on top of my froyo the other day.It got me craving for more! This is on top of my list. Looks so yummy!! Makes me want to run out and pick some blueberries right now!!! I love blueberry pie, and you are an excellent baker! You're so kind to think of the broader population that may be excluded from enjoygin your recipes because of dietary-restrictions... but think about it, isn't a blog inherently selfish? i mean, this is yur space to share whatever creations you feel like making. When you have a bakery or become a chef (which I know will happen soon!) then you must be concerned about everyone in the spectrum, but for now I say enjoy your creative spurs of craving and share with us whatever inspires you and fills your tummy! I love it all! Looks delicious! I recently made blueberry bars that were fabulous. I personally don't think you need to change your recipes to cater to more people. I think it's always helpful to offer substitutions or suggestions (ie: if you're allergic to almonds, try chopped walnuts) but not every blog caters to niche dietary needs. I think it;s good to blog recipes that you like and eat - that's what makes your blog unique! Gorgeous pie, and yes, more dairy free recipes please. i have to say that i totally agree with the Short (dis)Order Cook!! We love your blog because it is so uniquely you!! I,for one, am allergic to nuts, but have no problem omitting or substituting because your recipes are so delicious. Thanks for being my go-to for amazing sweet stuff!! I tried tofu for the first time at Yen Ching the other day. And you know what? I didn't hate it. Although, how could one hate something that tastes like nothing? You're killing me, Smalls. That's good that you didn't hate it. Did you have it in the hot and sour soup? You should try a bite of it next time we go to Mr. Yens. It tastes much better than that tofu. It soaks up all of that sauce like a sponge. Very tasty. HEY! This is almost exactly like my own unwritten version of my very most favorite pie! I love blueberry pie and I have fought for the last piece too! Your Aunt Joan! Congrats on the link from Saveur! I come from Maryland and NEVER EVER touched blueberry pie. It was always that gummy gross pie filling from a can. Then I moved to Maine, and discovered Wild Maine Blueberries. I've never tried to make a pie with fresh regular cultivated blueberries. Maybe I'll try it and see how they stack up. Pie looks great. Great crust too.